For all types of skin including sensitive and troubled skin types. Instead of water, snail secretion filtrate was used. 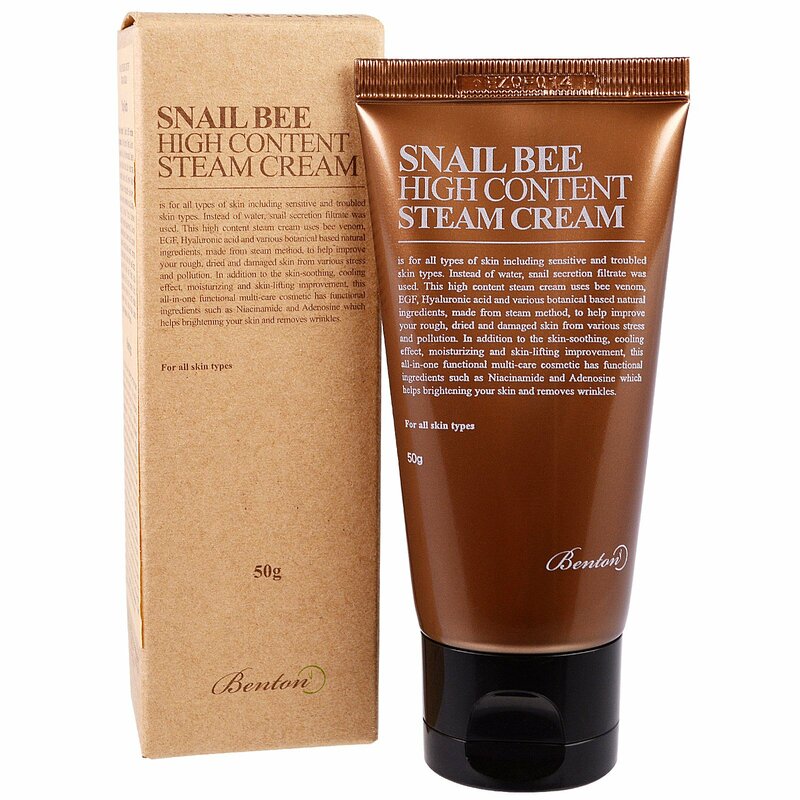 This high content steam cream uses bee venom, EGF, Hyaluronic acid and various botanical based natural ingredients, made from steam methods, to help improve your rough, dried and damaged skin from various stress and pollution. In addition to the skin-soothing, cooling effect, moisturizing and skin-lifting improvement, this all-in-one functional multi-care cosmedic has functional ingredients such as Niacinamide and Adenosine which helps brightening your skin and removes wrinkles. After washing the face, put the skin toner, essence and moisturizer, then dispense 1 or 2g and take an appropriate amount into your palm and evenly apply to the entire face. Please slightly tab to enhance the absorption. 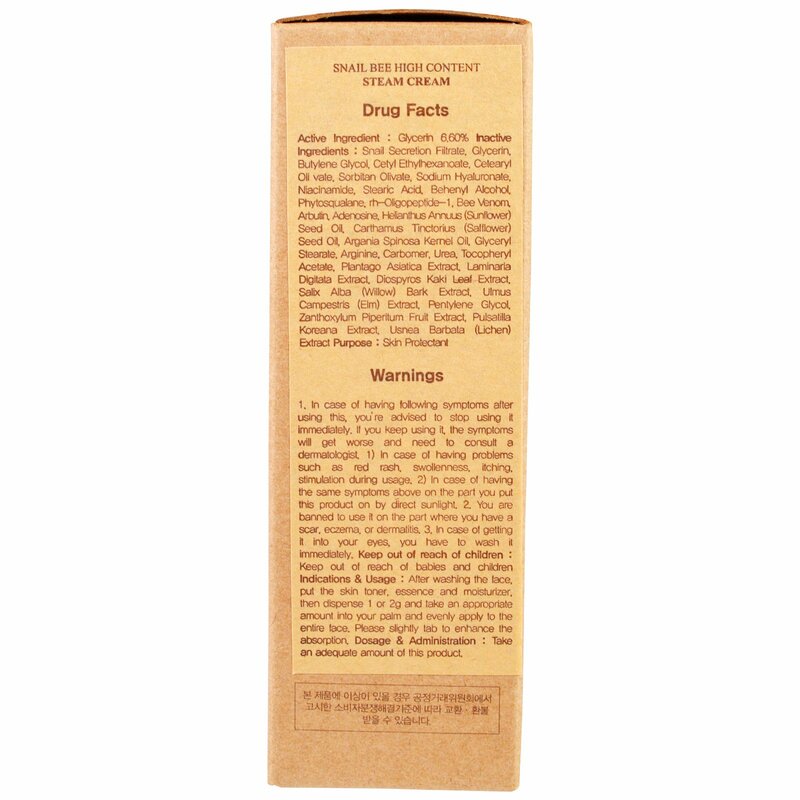 Inactive Ingredients: Snail secretion filtrate, glycerin, butylene glycol, cetyl ethylhexanoate, cetearyl olivate, sorbitan olivate, sodium hyaluronate, niacinamide, stearic acid, behenyl alcohol, phytosqualene, rh ogliopeptide-1, bee venom, arbutin, adenosine, helianthus annus (sunflower) seed oil, carthamus tinctorius (safflower) seed oil, argania spinosa kernal oil, glyceryl stearate, arginine, carbomer, urea, tocopheryl acetate, plantago asiatica extract, laminaria digitata extract, diospyros kaki leaf extract, salix alba (willow bark) extract, ulmus campestris (elm) extract, pentylene glycol, zanthoxylum piperitum fruit extract, pulsatilla koreana extract, usnea barbata (lichen) extract.